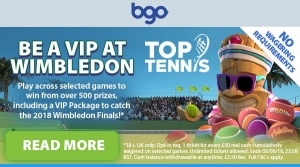 Both tennis fans and casino fans have a lot to look forward to in Bgo’s “top tennis” promotion that just became available. Take a friend with you to watch the Wimbledon 2018 finals live with VIP tickets, a world class dinner experience, and much more - and you could also get a piece of the massive £6,500 cash pool! The ball is in your court - Bgo has prepared a huge new promotion that no tennis fan can afford to miss. If you’ve ever dreamed of seeing the action live from Wimbledon, now is your chance. A complete tennis VIP experience awaits the lucky winner of the giveaway! The rules of the competition are quite straightforward: visit the promotion page at Bgo and click on the opt-in button to automatically enter the draw. After you’ve opted in, you’ll collect one ticket to the prize draw for every £50 you wager until the promotion ends on midnight, 3rd of June. Play selected games such as Archangels, Hotline, Jungle Spirit and many more, and put as many tickets in your pocket to increase your winning chances. The prize draw is taking place on the 5th of June, and over 500 happy players will leave with a cool prize. The grand prize is a VIP trip to Wimbledon for two which includes centre court seats, a 3-course meal, a night in a luxurious hotel, and much more awesomeness. The other winners will share a prize pool of £6,500, where the biggest prize is £1,000! Visit the promotion page at Bgo to read everything you need to know before you start playing. Bgo recently refined their welcome offer, and now is the perfect time to get onboard. The popular UK casino scrapped all confusing wagering terms and bonus rules a long time ago, and their new offer is even easier to understand: simply make your first deposit of £10 or more, and you will automatically get 100 bonus spins. Don't forget to tell the casino your mobile phone number when you sign up. 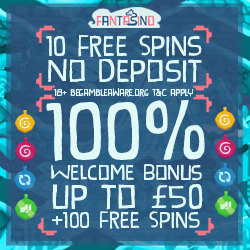 If you do you will recieve 10 no deposit spins as well! The spins have no wagering requirements attached to them, which means that you can do whatever you’d like with your winnings. Select one of four popular NetEnt games to play them on, and you can withdraw immediately if you’re lucky enough to score a big win – as there’s no max cashout rule in place. Click on the link to visit Bgo and read more about the fantastic welcome offer!